Gareth Southgate should be appointed England manager "as soon as possible" and be given the same contract as predecessor Sam Allardyce, says former Three Lions defender Danny Mills. Southgate, 46, was interviewed for three hours on Monday after an unbeaten four-match spell as interim manager. The Football Association says he is "the only candidate" for the role. "It's just been dragged out a bit," said Mills, 39. "I'm a little bit surprised with the FA." Mills played alongside Southgate for both England and Middlesbrough. "Surely you just give him the same contract as Sam Allardyce," he added. "They made these decisions under Allardyce - the money for the job." Former England striker Chris Sutton was critical of the interview process and said it was a "slap across the face" for Southgate. But former FA chief executive Adrian Bevington said he did not think it was "overcomplicating" the issue. After Allardyce's departure following a newspaper investigation, Southgate led England to two wins and two draws during his time in interim charge. "Gareth should be appointed as soon as possible," added Mills. "The job he's done is impeccable. "A lot of people say he's too nice. Yes, he's an absolute gentleman, and very articulate, intelligent, but he's got an edge." 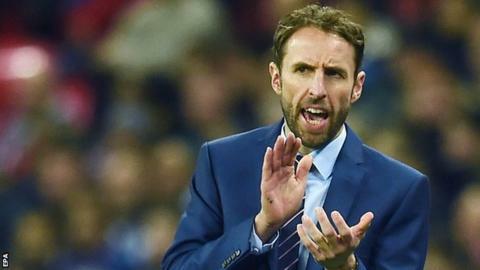 No decision on England's next manager is expected until 30 November, but Southgate is heavy favourite. The Three Lions are not in action again until 22 March, when they meet Germany in a friendly four days before their next qualifier against Lithuania. You're hired? Has Southgate done enough? Read more on Gareth Southgate: Has England interim manager done enough for permanent job?